Today SpeakUp is pleased to welcome guest author, Rachael Langley. Although prompting can be a useful teaching tool, it needs to be used thoughtfully to prevent prompt-dependency. As Kathleen Post from Midwestern University frequently says, “Compliance is not communication.” How then do we foster autonomous communication rather than mere compliance? Rachael shares some helpful suggestions below! It’s October and school is now in full swing! As many of us are back to learning and supporting AAC within the educational setting, it seems like a great time to talk about the role prompting plays in our instruction. The field of education tends to be filled with nurturing people who want to see kids succeed; and for that we are grateful. However, even the most caring, well-intentioned teacher (or parent) may fall into habits such as over-prompting learners, directing students what to say, and even physically assisting students to select a word or phrase for communication purposes. Sometimes we forget that prompting has a healthy, but limited, role in teaching language and communication skills through alternative means. prompted to communicate. For example, when given a gift, we often prompt children to respond with, “Thank you.” When loud, bodily noises escape their bodies, we prompt them to say, “Excuse me.” But for the most part, children learn language by observing skilled speakers communicate throughout the day. Bit by bit, typical learners put together the various rules and vocabulary associated with their world. Even that little bit of prompting typically fades by the time youngsters leave elementary school. By then, most kids flourish with communication autonomy. They get to select and use the words they feel are appropriate. They may embarrass their parents with their word choices from time to time, but this is also part of typical development. When speech and language do not develop typically, we find different methods to teach communication. We use augmentative/alternative communication tools with individuals who are pre-verbal or have limited communication skills to bridge the language gap and to offer an opportunity to develop communication autonomy. As teachers and parents, there is a drive to help that non-speaking child feel included by answering for them. In my experience, many people prompt without realizing they’ve done so. This is why we encourage AAC teams to establish common knowledge about prompting, agree upon definitions of prompting, and agree-upon how to use prompting with their AAC learners. Discuss teaching methods as a team. We are fortunate to have a fair amount of research pointing to quality strategies for AAC instruction and implementation. Research supports the use of aided language/augmented input as a valid teaching method for AAC (Allen, Schlosser, Brock & Shane, 2017). 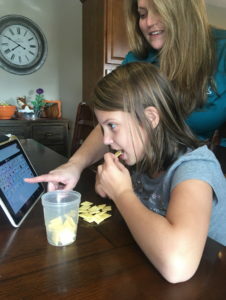 This means the teachers, parents, and other skilled adults speak as well as use the child’s AAC system. We use aided language/augmented input strategies without prompting or expectation, but rather to immerse learners in the symbol-language they need to use. Research also points to the use of a least-to-most prompting paradigm (Finke, E. et al., Feb 2017). Least-to-most prompting methods allow for the least amount of intrusion as the learner takes on greater amounts of responsibility for message formulation. Read about the pitfalls associated with prompt dependency. By nature, prompt dependency is in direct contradiction with communication autonomy. Define levels of prompting as a team. What one person describes as “minimal prompting” might be what another person considers “moderate prompting.” “Physical prompting” might mean a tap on the arm or elbow to one person, and to another, could mean a full hand-over-hand intervention to make the student complete a desired task. Consider using a prompt hierarchy with visual reminders of agreed-upon prompts and frequency of uses. 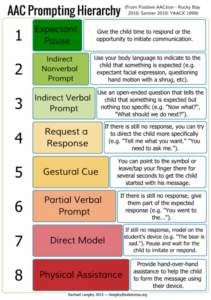 The least intrusive prompt is an “expectant pause.” This means giving additional wait time and allowing the learner to feel an expectation to initiate and participate rather than using more intrusive verbal prompts (e.g. “Which one is it? Show me which one.”). Make your agreed-upon prompts clear and visible to the team. If the team agrees to use aided language input as an instruction method, make sure all the team members are trained and have access to ongoing coaching. Aided language input sounds simple, but is often overwhelming to team members who are new to AAC. Will you put hands on the learner? If the shared goal is that learners develop communication autonomy, consider limiting or removing the use of physical prompts. Discuss what team members need to do to model potential communicative responses so students can communicate their desired message. Review the plan as needed. Bring new staff and team members up to speed on the team’s expectations regarding prompting. Prompting is a successful instructional tool. But often times we are not aware of the frequency with which we use prompts. Sit back and take note of how often you are prompting. As a speech-language pathologist, I must admit that I am frequently (FREQUENTLY) guilty of over-using verbal prompts. We are talkers and we fill quiet spaces. I have to be intentional about giving a learner room to initiate and communicate. Allen, A. A.., Scholsser, R. W., Brock, K. L. & Shane, H. C. (2017) The effectiveness of aided augmented input techniques for persons with developmental disabilities: a systematic review. Augmentative and Alternative Communication, 33: 3, 149-159. doi: 10.1080/07434618.2017.1338752. Finke, E. H., Davis, J. M., Benedict, M., Goga, L., Kelly, J., Palumbo, L., … Waters, S. (2017). Effects of a Least-to-Most Prompting Procedure on Multisymbol Message Production in Children With Autism Spectrum Disorder Who Use Augmentative and Alternative Communication. Am J Speech Lang Pathol, 26(1), 81-98. doi: 10.1044/2016_AJSLP-14-0187. Rachael Langley is a speech-language pathologist working as an Augmentative/Alternative Communication (AAC) specialist in Mid-Michigan. Her 15-year career has focused primarily on supporting students with complex communication needs. A two-time graduate of Michigan State University, Rachael has served as a clinical faculty member and guest lecturer at several local universities. She is one of the founders and organizers of the #TalkingAAC Conference, the only conference of its kind in Michigan. Rachael enjoys creating and sharing materials that focus on practical strategies for educators and families. Thank you for reading this blog post. The views expressed in this post are that of the author, and do not necessarily reflect the views and policies of USSAAC members and board members. No endorsement by USSAAC is implied regarding any device, manufacturer, resource or strategy mentioned. We would love to hear from you. Please share your thoughts with a comment below or send a message through our contact page.